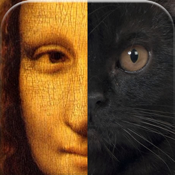 This application combines two "faces" into one. You can see the face created from your face and another person's. Let's look at the magical face. Is that a great beauty or a monster? The combined face looks like someone we have never seen before. You will get the imaginary face photo album. 1. Prepare two face images (Face A and B) as the parents of the combined face. 1-1. To select Face A, touch the gallery icon then select an image or touch the camera icon to take a picture of a face. 1-2. Adjust the position of the eyes, mouth, nose and ears by using the red face contour icons(face anchors). 1-3. Select Face B and do the same thing. 2. Touch the "Montage" button to combine the two faces. You can change the blending ratio of A to B by using the slider bar. Share your favorite faces on Facebook or Twitter! You can share the face photos with face anchors by email or Twitter. iOS >Settings >Location Services >FaceMontage >On. This application only uses the Location Services to get the face anchors from the face photo, and does not determine the current position or use any GPS data.